affected tooth, use an excavator and gently remove the debris from the lesion. If this exposes the tooth pulp, drainage will result, and the pain will disappear. NOTE: Do not dig or gouge through the caries to reach the pulp. If drainage does not result when debris is removed, have the patient rinse with warm saline for 10 minutes every 2 hours. This may result in forming a gumboil for drainage to pass through. The method is also reliable if a gumboil is present when the patient reports for treatment. NOTE: Never apply heat to the face because it may cause drainage through the face rather than the abscess. As a last resort, if drainage does not result from the two methods already mentioned, apply ice packs to the affected area. They can be safely applied to the external surfaces of the face and will reduce the patients discomfort until proper treatment can be given. 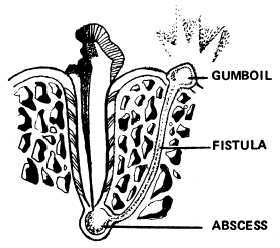 Figure 2-11. Gumboil caused by a periapical abscess. 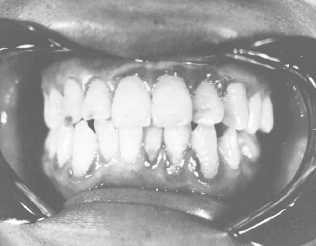 Gingivitis is an inflammation of the gingival tissue as illustrated in figure 2-12. In marginal gingivitis, the inflammation is relatively mild and is sometimes localized, existing around one, two, or several teeth. The most frequent cause of marginal gingivitis is poor oral hygiene. SYMPTOMS The patient most likely will present with sore, swollen, bleeding gums. SIGNS You may notice a painful reaction or gingival bleeding when you apply finger pressure to the affected area. You may also see a red, swollen gingivae with a loss of stippling; cuts or abrasions on the gingivae; and heavy plaque and calculous deposits in the affected area. TREATMENT Give the patient plaque control instruction as explained in NAVEDTRA 10677, and refer to a dental treatment facility for scaling and polishing.